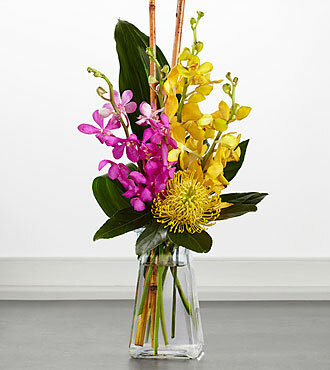 Escape to a world colored in island brights with this truly stunning tropical flower bouquet. Fuchsia mokara orchids are brought together with luminous yellow mokara orchids accented with yellow pincushion protea, tropical leaves, and natural rivercane stems to create a truly impressive display. Presented in a gathered square clear glass vase, this tropical flower arrangement is that unique birthday, thank you, or thinking of you gift youve been searching for.